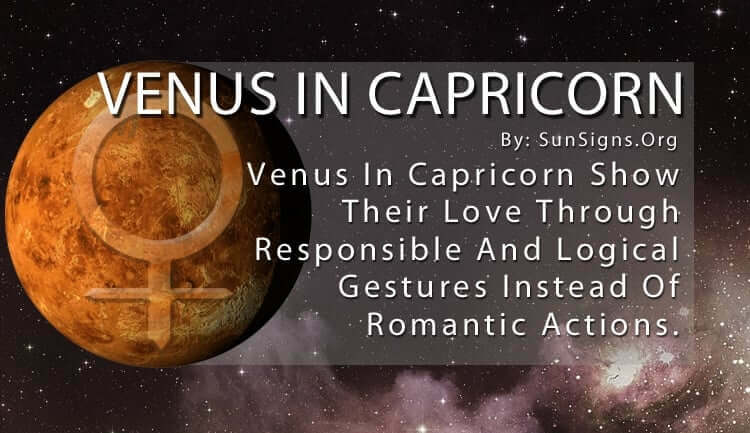 Capricorn is one of the most disciplined of the zodiac signs, so Venus in Capricorn shows their love through responsible and logical romantic gestures. They show you how they are able to take care of you, rather than trying out grand romantic actions. They are proud of their stability and control. Venus represents love, creativity, allure, relationships, money, and finance. While Venus in Capricorn doesn’t take much leisure time for themselves, they do purchase symbols of their status. Climbing the corporate ladder is the most important thing to them, and they display their ranking through their wealth and personal possessions. In fact, this is the first thing they want a potential partner to notice. While they aren’t into romance, they will take you out to an expensive restaurant or a sold-out theater performance just to show off their financial prowess. Venus in Capricorn is all about security and practical decisions, so they always have plenty saved for a rainy day. This is what they put forth when looking for a soul mate. They are all about long-term commitments and are looking for someone who is in the relationship for the same reason they are. The Capricorn Venus people are planners who know exactly what they want and who they want to share it with. They aren’t into dating for a fling. They are looking for a husband or a wife who can handle everyday responsibilities as well as they can. While some see this as boring, others can see the hidden romance behind the idea. They are ready to take things to the next level, for they have been preparing for that moment since they were old enough to do so. They have built a stable home and bank account, all for the purpose of supporting their loved ones. If you’ve already been together for a long time, don’t forget to continuously show your appreciation for all that you have. It’s easy to slip into a comfortable pattern, which is what Venus in Capricorn wants. But don’t allow yourself to become lazy with your involvement in the relationship. To show your affection for your Venus in Capricorn lover, all you need to do is appreciate the stable environment they have created. Show how impressed you are by their wealth and say thank you when they spend it on you. Also, express your desire for a stronger commitment if you’re still dating. Your partner is the hardest working person you will ever meet, and they will expect the same kind of effort from you. If you are as reasonable and logical as Venus in Capricorn, then they will always be attracted to your practical nature. Don’t go overboard when trying to impress them. Simply treat them to a fancy evening at their favorite places and they will adore you forever.